“Spring at last! Spring at last! 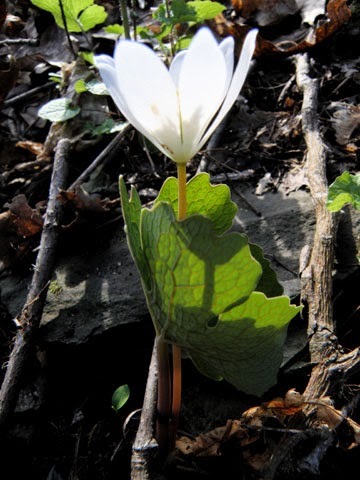 Thank god almighty, it’s Spring at last!” Time to be back in the woods, searching for the wily ramp and shy morel (and admiring the early bloodroot, columbine, and wood anemone). You can (if so inclined) follow us on Facebook, and Twitter. You can also find links to all of our online scribbles at A Quiet Little Table in the Corner. One can even hear some of our representative blather at Roll on the Radio. Roll Magazine also published a much re-worked article on artichokes, My Cynara Redux, a tale of thwarted lusts of various kinds. Anatomy of the Cookbook, or, What is a Recipe? Do Content Aggregators Take Advantage of Food Bloggers? “The Resource Guide for Food Writers, Update #163” is protected by copyright, and is provided at no cost, for your personal use only. It may not be copied or retransmitted unless this notice remains affixed. Any other form of republication -- unless with the author’s prior written permission -- is strictly prohibited.